Off late, I’ve been travelling a lot in South India, I’ve been fascinated by some of the really amazing things I’ve come up on my trips. Especially to do with Ancient technology of the humans. Soon, I’ll be speaking at the BarCampMumbai on ‘Ancient Indian Technology’ and that’s when I found some fascinating facts about India that connected Indians to the Romans. While I’m going to solely focus on Ancient Indian technology there, Rome is something that has also fascinated me in terms of Ancient Technology. 1. Roman trade with India through the overland caravan routes via Anatolia and Persia, though at a relative trickle compared to later times, antedated the southern trade route via the Red Sea and monsoons which started around the beginning of the Common Era (CE) following the reign of Augustus and his conquest of Egypt in 30 BCE. 2. Roman trade diaspora frequented the ancient Tamil country (present day Southern India) and Sri Lanka, securing trade with the seafaring Tamil states of the Chola, Pandyan and Chera dynasties and establishing trading settlements which remained long after the fall of the Western Roman Empire. 3. Prior to Roman expansion, India had established strong maritime trade with other countries. The dramatic increase in Indian ports, however, did not occur until the opening of the Red Sea by the Romans and the attainment of geographical knowledge concerning India’s seasonal monsoons. 4. The Romans learnt the number 0 from Ancient India, through Aryabhatta, however detested it, only to accept it later and of course the entire world did. So here’s what my Bucket List looks like. And without a doubt, it has to do with Ancient Roman Technology, just as fascinating as Ancient Indian Technology. The Equestrian Statue of Marcus Aurelius is an ancient Roman statue in the Campidoglio, Rome, Italy. It is made of bronze and stands 3.5 m tall. Although the emperor is mounted, it exhibits many similarities to standing statues of Augustus. 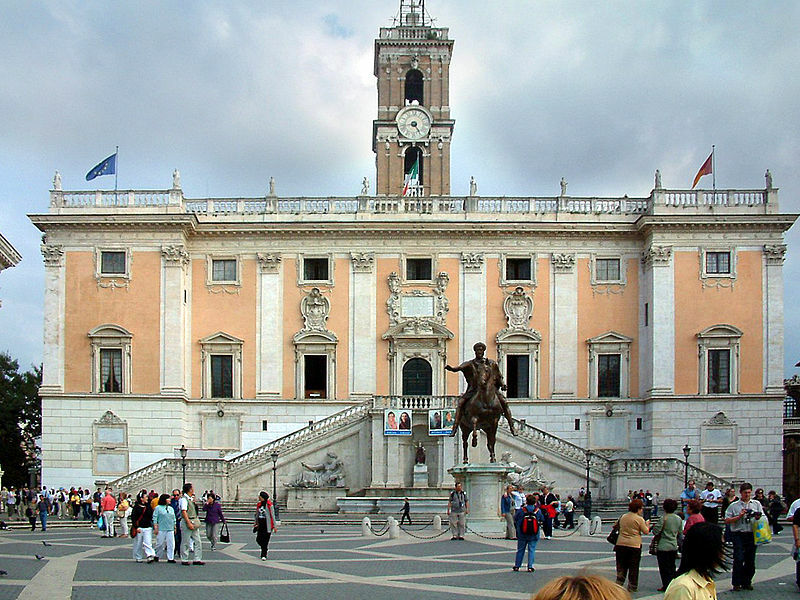 The original is on display in the Palazzo Nuovo, with the one now standing in the open air of the Piazza del Campidoglio being a replica made in 1981 when the original was taken down for restoration in the Palazzo. Although there were many equestrian imperial statues, they rarely survived because it was practice to melt down bronze statues for reuse as coin or new sculptures in the late empire. Statues were also destroyed because medieval Christians thought that they were pagan idols. 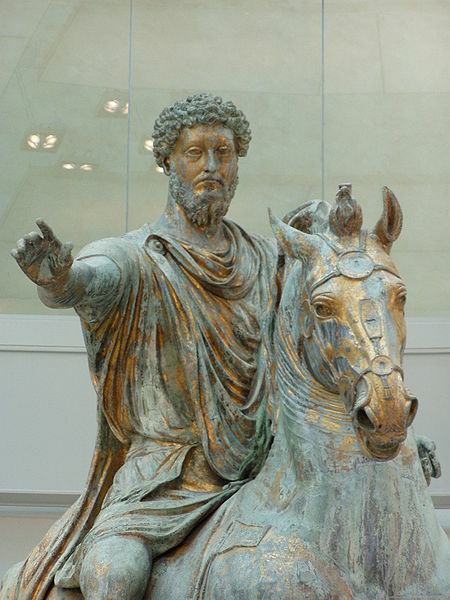 The statue of Marcus Aurelius was not melted down because in the Middle Ages it was incorrectly thought to portray the first Christian Emperor Constantine. Indeed, it is the only fully surviving bronze statue of a pre-Christian Roman emperor. The Colosseum, or the Coliseum, originally the Flavian Amphitheatre (Latin: Amphitheatrum Flavium, Italian Anfiteatro Flavio or Colosseo), is an elliptical amphitheatre in the centre of the city of Rome, Italy, the largest ever built in the Roman Empire. 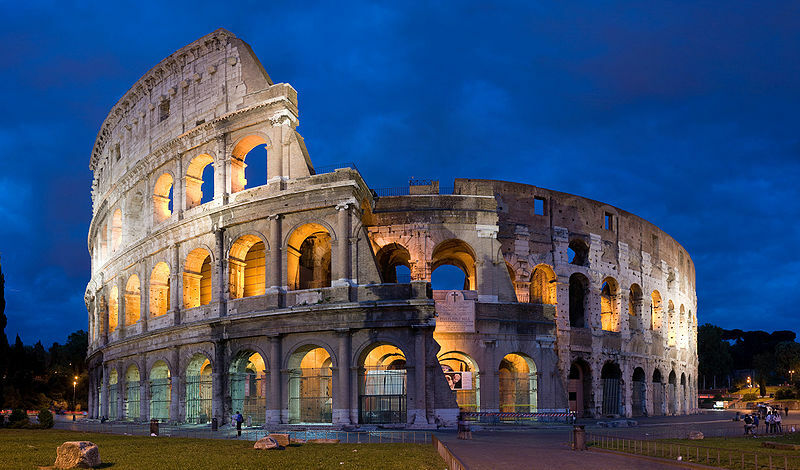 It is considered one of the greatest works of Roman architecture and Roman engineering. Occupying a site just east of the Roman Forum, its construction started in 72 AD under the emperor Vespasian and was completed in 80 AD under Titus,with further modifications being made during Domitian’s reign (81–96). The name “Amphitheatrum Flavium” derives from both Vespasian’s and Titus’s family name. 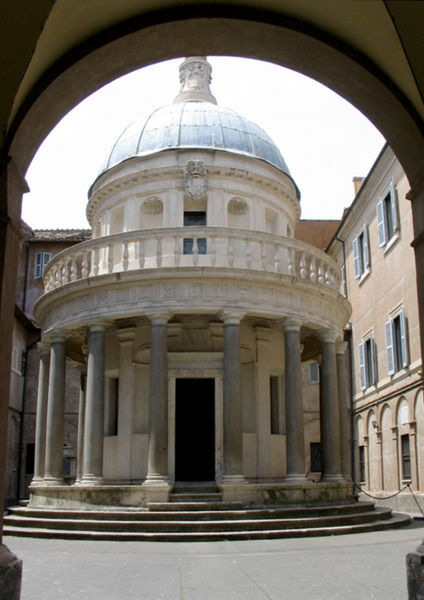 The Tempietto (San Pietro in Montorio), which is an excellent example of Italian Renaissance architecture. The church is decorated with artworks by prominent 16th- and 17th-century masters. The first chapel on the right contains Sebastiano del Piombo’s Flagellation and Transfiguration (1516–1524). Michelangelo, who had befriended Sebastiano in Rome, supplied figure drawings that were incorporated into the Flagellation. The second chapel has a fresco by Niccolò Circignani (1654), some Renaissance frescoes from the school of Pinturicchio, and an allegorical sibyl and virtue attributed to Baldassarre Peruzzi. Elliptical courtyard with central figure sculpture. At the top of the “Cordonata” steps, also by Michelangelo. A short walk to the south (starting out south-west) from the Piazza Venezia. The bird’s-eye view of the engraving by Étienne Dupérac shows Michelangelo’s solution to the problems of the space in the Piazza del Campidoglio. Even with their new facades centering them on the new palazzo at the rear, the space was a trapezoid, and the facades did not face each other squarely. Worse still, the whole site sloped (to the left in the engraving). Michelangelo’s solution was radical. The three remodelled palazzi enclose a harmonious trapezoidal space, approached by the ramped staircase called the “Cordonata”. Since no “perfect” forms would work, his apparent oval in the paving is actually egg-shaped, narrower at one end than at the other. The travertine design set into the paving is perfectly level: Around its perimeter, low steps arise and die away into the paving as the slope requires. Well, these are some of the most interesting and fascinating things that I would be interested to visit in Rome. 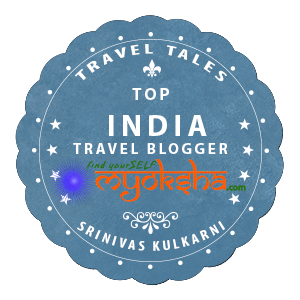 This entry was posted in Tales Across the World and tagged Cheap Flights to Rome, Colosseum, Equestrian Statue of Marcus Aurelius, Flights, Italy, Rome, The Tempietto on February 16, 2012 by srinistuff.